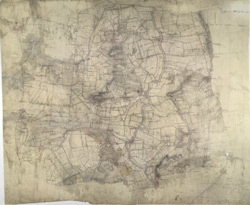 A dashed red-ink line at the bottom of this plan divides the counties of Lincolnshire, Nottinghamshire and Yorkshire. Dykes and drains predominate, and the River Trent is shown running from Althorpe, at the top of the plan, to Gainsborough, at the bottom. The manuscript is quite worn, dirty and ripped, making it difficult to interpret.